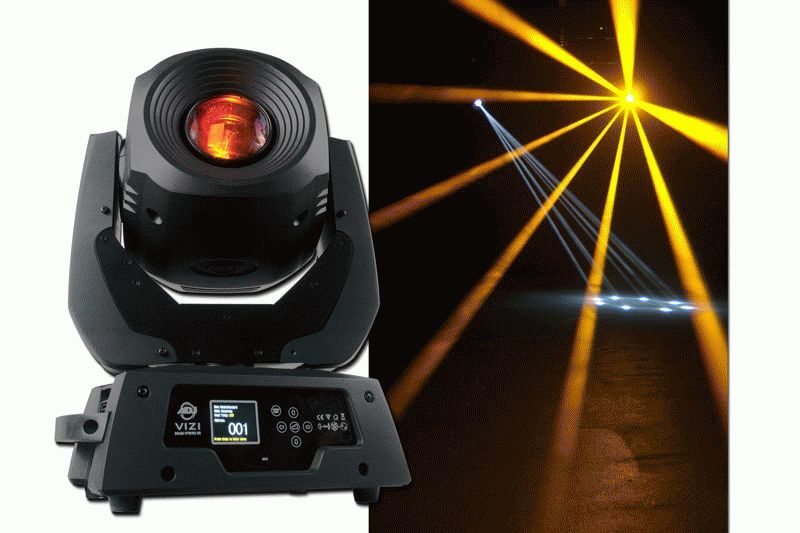 ADJ has introduced one of its most sophisticated moving head fixtures to date: the Vizi Beam Hybrid 2R. A visually striking, razor-sharp beam effect with a tight 4° beam angle, the lightweight, energy-efficient Vizi Beam Hybrid 2R is designed for small clubs, installers, churches and exhibit builders who want to add the visual excitement of intense-beam effects to their lighting designs. Going beyond sharp, brilliant beams, this versatile fixture offers a host of other professional features and effects, including a Frost Filter that allows it to do double-duty as a wash effect – thus, the “hybrid” in its name! It also includes 14 colors, including UV filter, white, and CTO and CTB color correction; 8 fixed gobo patterns plus spot; gobo scroll mode; an 8-facet prism; pulse effect; random strobe from slow to fast; and 0–100% dimming. The gobo wheel and color wheel are independent of each other, so both can be used at the same time and gobos and colors can easily be changed out on the fly. Part of ADJ’s popular Vizi Series of intelligent fixtures, the Vizi Beam Hybrid 2R is powered by the eco-friendly Philips MSD Platinum 2R—a revolutionary 100-watt light source that boasts an output comparable to a 250-watt discharge lamp. The incredibly bright Vizi Beam Hybrid 2R not only consumes significantly less power, but it’s much faster than previous ADJ moving heads because it is lighter in weight and more compact than other fixtures in its class. It’s low-maintenance, too: The unit’s Philips MSD Platinum 2R lamp has an estimated life of 10,000 hours. The Vizi Beam Hybrid 2R is fully DMX compatible, with 16 channels that can be controlled from any DMX-512 console. A built-in 4-button LED menu display on the unit makes it extremely easy to navigate all the DMX settings. Users who are unfamiliar with DMX programming can operate the Vizi Beam Hybrid 2R in Sound Active and Master/Slave modes using the unit’s built-in programs, which create their own amazing lightshows at the touch of a button. Other professional-caliber features on the Vizi Beam Hybrid 2R, include auto X–Y positioning, 540°/630° pan and 8-bit 270° tilt (with 16-bit fine pan/tilt control), stepper motors with micro stepping, and 3-pin XLR in/out. The Vizi Beam Hybrid 2R is extremely cool-running, so it can operate all night long without duty cycles. It consumes just 210 watts of power at maximum use, and a UL-listed multi-voltage power supply (AC 100–240V, 50/60Hz) allows it to go virtually anywhere. The unit is easy to transport, measuring 9”L x 12.5”W x 16.75”H (225 x 310 x 420mm) and weighing just 17 lbs./8kgs. The Vizi Beam Hybrid 2R has an MSRP of $2,199.95.